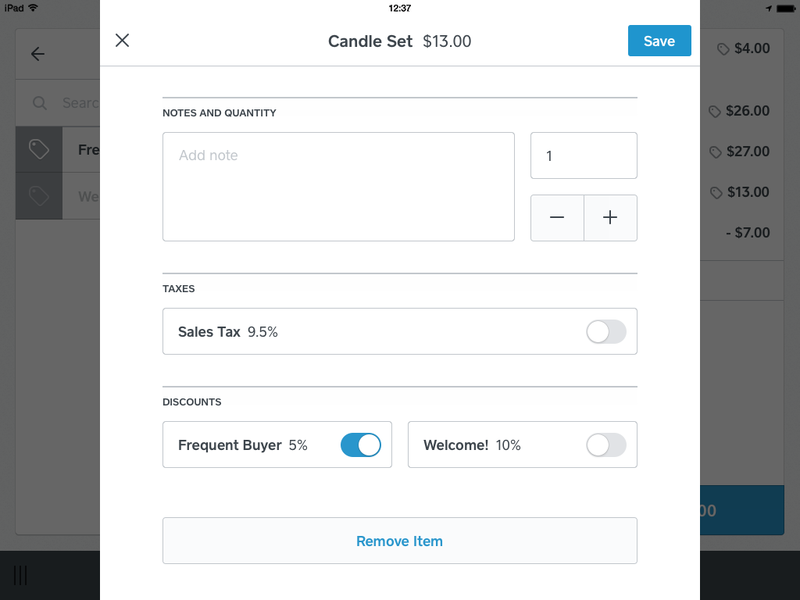 With Square, you can manually or automatically apply pre-set percentage or dollar amount discounts to your sales. Learn more about creating discounts. Note: Percentage discounts can be applied to an entire sale or to individual items. Dollar amount discounts can only be applied to an entire sale at this time, unless you’re using automatic discounts. Discounts are applied before taxes. Apply discounts manually from your item library, the favorites pages on your Android tablet or iPad, or by tapping an item in the cart and toggling on the discount. If you have set up automatic discounts, they will be added to the sale when the rules you have set have been met. Note: If discounts are not applying according to rules you set up in your dashboard, try updating the Square app to make sure you have the latest version and features. From the Square Point of Sale app, select a discount from your item list in the Checkout screen or favorites page if you’ve saved discounts to it. Toggle on the pre-created discount you’d like to apply. Note: A manually-added automatic discount will apply to all items in the cart, not just items selected in that discount’s rules. The applied discount will appear as a Discounts line item within the current sale. Under Current Sale in the Checkout screen, tap the item you’d like to discount. Toggle on the pre-created discount you’d like to apply. Note: Manual dollar discounts cannot be applied at the item level. For commonly used dollar discounts, consider creating an automatic dollar discount or separate price points. From Checkout, tap the list icon to view all items. Tap the discount you’d like to apply to add it to the current sale. Note: A manually-added automatic discount will apply to all items in the cart, not just items selected in that discount’s rules. Tap the item you’d like to discount. Tap the discount you’d like to apply to add it to the current sale. A discount is added to a sale. Square calculates the discounted sale total. A second discount is added, which is applied to the total discounted sale price. If you’re applying a combination of dollar and percentage discounts, the percentage discount will be applied first followed by the dollar amount discount. Note: You can apply a specific discount to a given sale only once. Keep in mind, the Federal Trade Commission (FTC) prohibits misleading “former price comparisons.” If you advertise or promote item(s) at a discounted price, it’s your responsibility to ensure you’re meeting the FTC’s guidelines. We recommend you reach out to a legal expert if you have questions about the FTC’s guidelines.